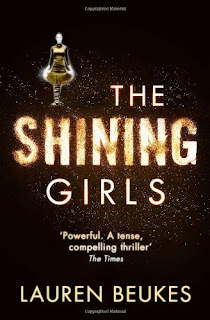 The Shining Girls was a book that I stole from my mum after she had finished reading it, although she seems to have forgotten it entirely by the time that I actually got round to reading it. 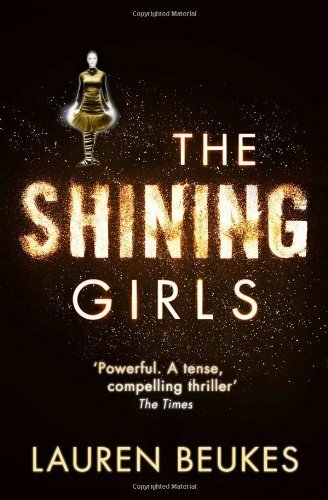 I took it partly because I was intrigued by the premise, and partly because I had heard good things about the author Lauren Beukes. The Shining Girls focuses on two main characters, Kirby and Harper. Kirby is a young woman who is trying to put her life back together after a brutal attack that nearly killed her. Attempting to track down the man who tried to kill her, she starts finding evidence that she isn't the first woman who he has attacked, but some of the evidence is just impossible. Meanwhile Harper, having found a house that inexplicably allows him to travel anywhere within the years 1929 and 1993, is compelled to kill a set of girls whose names he has found written on the walls of one of the rooms upstairs, leaving a memento from one of his other kills at the scene of her death. So I really wanted the whole time travelling serial killer premise to work for me, but it just doesn't. It's quite disappointing, especially as the writing itself is solid and engaging. But for me, the time travel just wasn't implemented well, leading to two main problems. Firstly, it's really tough to make a thriller tense when you know that most of the awful stuff that the serial killer is going to do has, in another character's timeline, already happened. Sure, the murder scenes are really well-written and horrifying in and of themselves, but it's tough to maintain the tension when the reaction to each new female perspective chapter is "well, here's the next sacrificial lamb". The time and attention spent fleshing them out and giving them engaging problems seems kind of wasted since the reader knows that the next time their name crops up, they'll be dead by the end of the chapter. Secondly, it uses my most despised type of time travel, the ontological paradox, also known as a causal loop. If you're not familiar with that, essentially it's if person A is given an item by the elderly person B, then goes back in time to give that item to a younger version of person B. At which point you sit there and wonder how the item came into being in the first place if it's constantly looping between two points in time. It drives me up the wall, and the aggravating part is that Beukes spends so much time setting up this closed loop. Spoiler alert, it turns out at the end that the reason the House makes Harper want to kill people is because the House is Harper's spirit. Which is just infuriating, because it wants to be so clever and thematic, but it just brings up questions. How are the girls picked out as victims? Harper keeps mentioning that they shine, but the narrative never elaborates on what that is exactly. The only way that Harper knows about who he needs to kill and when he needs to go to kill them is via the House, so there's never any thought process about why or how his victims are selected. It unwittingly leads to Harper being a more or less flat character, as he has no real motivations other than follow the House's lead, for reasons that are never explained.